In the early 20th century, a few pioneers combed the back woods of rural Appalachia to document and record the last unspoiled remnants of American roots music, still unchanged by the cultural upheavals of the 20th century. (See, John Lomax, Peermusic). 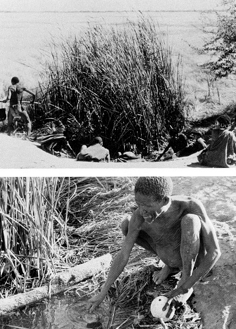 In the middle of the 20th century, Laurence Marshall and his family made three expeditions, between 1950 and 1956, to study and film the Bushmen of the Kalahari Desert, who were among the last surviving hunter-gatherer societies in the world. The Harmless People, authored by the daughter, is a unique and beautifully written record of the hunter gather experience just before encroaching modern civilization brought about its demise — at least as a self sustaining ancient tradition. Are you a bushman at heart? I imagine anyone truly drawn to a Taoist worldview are Bushmen at heart. By this, I mean anyone skeptical of civilization’s promises of progress. Our ‘gut knows’ the unintended tradeoffs humanity has made following the agricultural revolution some 10,000 years ago. I suppose you could say we ‘taoists’ are genetic outliers to a degree; we don’t fit in, despite how civilization’s storyline has been programming us from birth onward. To be fair however, I honestly think everyone fits this description to some degree, albeit, deep down. It is a matter of degree. Folks most enamored with the comfort and security that civilization promise will not be able to relate to this… even so, that may only be a matter of time (1). I don’t have much more to say—for once—other than to say I highly recommend The Harmless People by Elizabeth Marshall Thomas! The observations help put context and meaning into what it is to be human. Although we are not hunter-gathers in life style anymore, the instincts that drove them then still drive us today! They just manifest themselves differently now in emergent property ways, (e.g., shopping is a form of hunter gathering). Reading this ethnographic research can help reconnect us to our ancestral roots — spiritually speaking. Particularly noticeable to me is how much of Bushman life hinges on the fairness instinct. I see this true for modern people, but it often manifests itself much more subtly. 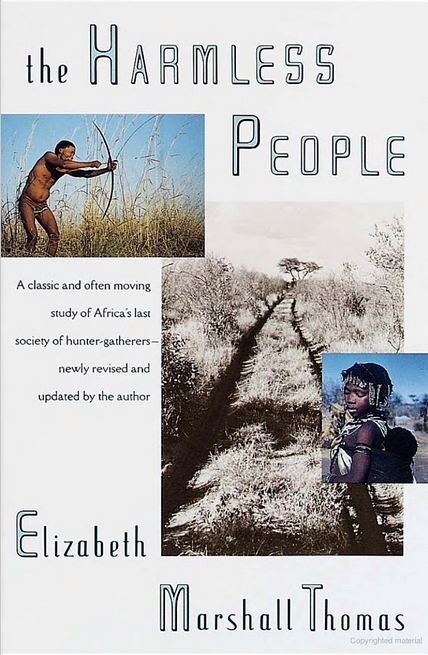 I don’t hold with Elizabeth on about how she sees the loss of the Bushmen life style as deplorable. I mean, I do sympathize and deeply morn the tragedy, but then that is life, isn’t it? Life encompasses unavoidable suffering as it ebbs and flows through loss and gain—at least from a Buddhist and Taoist perspective. Certainly, at some level we all feel that something is amiss, and idealize either the ‘good old days’ or ‘a better future’. The truth is, something must always be ‘wrong’ in the evolutionary process. If it was ‘right’, then what’s to evolve? ‘In the big picture’, I see the Bushmen’s loss as merely another ‘passing season’ in our species’ evolution. 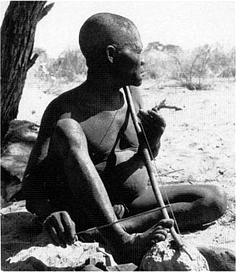 To be honest, the Bushmen old way life style replaced the life style that preceded it… i.e., pre 35,000 years ago. I find that I trod through life more gracefully by embracing nature’s ways, both ebb and flow. Frankly, evolution is a journey down the bumpy road of extinction and renewal. “If you can fight ‘em, join ‘em”, as the saying goes. Knowing doesn’t speak; speaking doesn’t know. This is called profound sameness.